Halloween – a time of year marked by adventures through decorated neighborhoods and the consumption of candy. But do you know the holiday’s origins? The origins of Halloween begin with the ancient Celts, from over 2000 years ago in the first century B.C.E. For the ancient Europeans, this was a time of darkness, but it marked the beginning of the year in their calendar. Darkness did not always have a negative connotation to ancient peoples of the world; this was a time of harvest as well as a time of death, where many people moved on from the world of the living because of harsh conditions. However, it was also a time people believed to be closest to the “otherworld,” so in a way it acted as a kind of family reunion with those that had passed away. In other words, family members were dead but not “gone,” which was comforting to the ancient people (Trevarthen 6). Nowadays, Halloween is often linked with fear. Some folks argue that this allows us to embrace our challenges and come out on top. Others believe it is a time for imagination, dressing up, and promoting family fun. Some choose not to celebrate at all (Rearick 79). 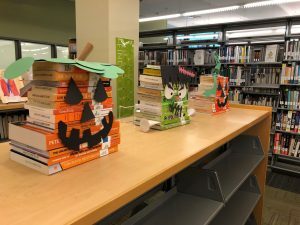 Regardless of your celebrations (or lack thereof) we hope you stop by the library to check out some spooky books, or simply to grab a handful of candy! Rearick III, Anderson M. “Hallowing Halloween.” Christianity Today, vol. 44, no. 11, Oct. 2000, p. 79. EBSCOhost, ezjtcc.vccs.edu:2048/login?url=http://search.ebscohost.com/login.aspx?direct=true&db=a9h&AN=3603131&site=ehost-live&scope=site. Trevarthen, Geo Athena. “The Celtic Origins of Halloween Transcend Fear.” Phi Kappa Phi Forum, vol. 90, no. 3, Fall 2010, pp. 6–7. EBSCOhost, ezjtcc.vccs.edu:2048/login?url=http://search.ebscohost.com/login.aspx?direct=true&db=a9h&AN=54311450&site=ehost-live&scope=site.